Old Dubai meets authentic Italy at this hidden gem by the Creek. Where the charm of Old Dubai meets New Dubai’s skyscrapers, you’ll find the Al Bandar Rotana, a relatively new hotel on the north shores of the Creek. And inside it is Gusto. 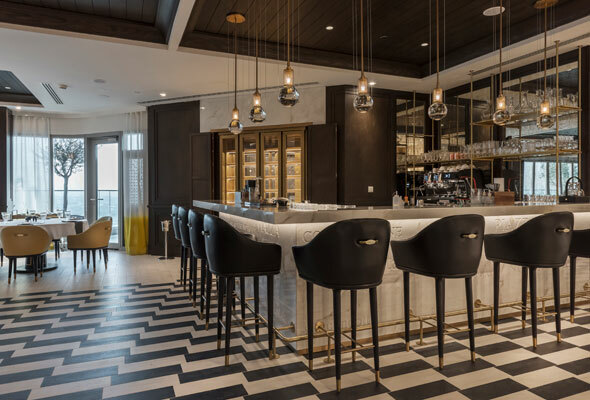 Perched on the 18th floor, it’s a cosy Italian restaurant with a modern trattoria feel thanks to a monochrome colour scheme with zig-zag printed floors, furnished with black chairs, white tablecloths and chrome shelves stacked with mismatched trinkets. When the weather cools, pay their terrace a visit to soak up some stunning city views. Featuring both high bar stools and restaurant-style seating, you can see across the Creek, through Old Dubai and right across to the Burj Khalifa and Downtown. Inside the restaurant, the menu is presented on an old-school, free-standing black metal menu holder, lit with a single lamp. 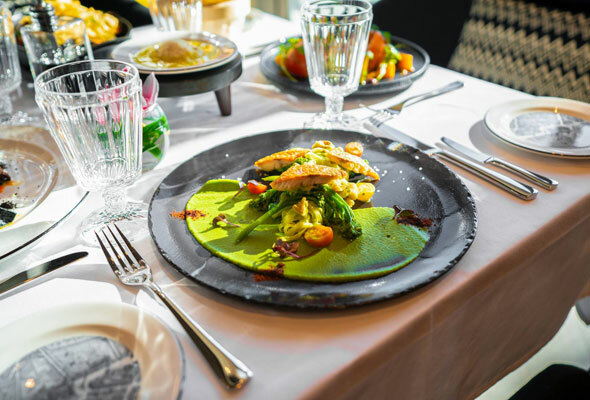 The half dozen starters and dozen main courses change on a fortnightly basis, depending on the ingredients available to Gusto’s chef. There are some safe dishes such as burrata and quinoa salad, mixed with some more unusual options. To start, the veal crostini (Dhs79) and baked Tomino cheese (Dhs64), were both ample portions. Four large slices of warm bread served as the base to the veal crostini, layered with generous carvings of flavourful, cold-cut veal and then drizzled in a rich tuna and anchovy-based tomato sauce. It was rich, but not overpowering. The second starter was equally large and beautifully presented, with two layers of gooey Tomino cheese flaked with crunchy toasted almonds and porcini mushrooms served on a thick truffle sauce. It was another dish of rich flavours that were harmoniously paired. For mains, the grilled sea bream (Dhs179) offers diners a chance to head to the open kitchen to watch the chefs at work. Two freshly grilled fillets were placed on cooked asparagus, and surrounded by roasted tomatoes and baby potatoes. Slightly over-sauteed spinach finished the dish, but was a welcome addition to the drier textures of the fish and potatoes. The second main course, ravioli al plin (Dhs124), was a highlight. The freshly made pasta was stuffed with tender veal chunks, served with veal shank and a herb gremolata. It was a taste explosion that was filling without feeling overpowering. Gusto combines great Italian cuisine in a cosy setting with some stunning views across both Old and New Dubai, and this hidden gem will definitely be seeing us again.